Morning sickness is the nausea and vomiting experienced during pregnancy, particularly in the first trimester. Although it is called morning sickness, it can and usually does occur at any time of the day or night. Morning sickness is characterized by extreme nausea and vomiting. It varies widely in intensity; some women experience only minor stomach upset for a very brief time period, while others become so ill that they have difficulty keeping food and fluids down and functioning normally. In the majority of women, morning sickness symptoms subside toward the end of the first trimester (at 12–14 weeks). However, some women continue to experience nausea well into the second trimester, and some mothers of multiples (twins, triplets, etc.) may have morning sickness throughout their pregnancy. Hormones. The pregnancy hormone hCG enters the bloodstream in high levels in the first trimester of pregnancy. These high hormone levels may trigger activity in the nausea and vomiting center of the brain, which is located in the brainstem. Muscle relaxation in the digestive tract. During pregnancy, the muscles of the gastrointestinal tract relax, slowing the digestion somewhat and possibly contributing to nausea. Heightened sense of smell. Pregnant women experience a heightened sense of smell during pregnancy that can transform unpleasant odors into unbearable, nausea-producing scents. Excessive salivation. The phenomena ptyalism, or excess saliva, is another symptom of pregnancy that can cause nausea in some women. Postnasal drip. Many pregnant women experience postnasal drip and/or nasal congestion, triggered by high levels of estrogen in their bloodstream. Estrogen increases the blood flow throughout the body, including the mucous membrane of the nose. This postnasal drip contributes to upset stomach in many pregnant women. Because it is such a common occurrence, morning sickness is easily diagnosed in pregnant women. A healthcare practitioner should question the patient about her pregnancy symptoms during each prenatal visit. In women who are visiting their healthcare providers because of unexplained nausea, morning sickness is sometimes the first symptom or sign of pregnancy. Nausea and vomiting accompanied by abdominal pain may indicate a more serious problem than simple morning sickness, such as gall bladder or pancreatic disease. Women who experience pain symptoms in conjunction with their nausea should contact their healthcare provider or an emergency medical facility immediately. Eat small, frequent meals. When the stomach is empty, it produces acid that irritates the stomach lining. In addition, an empty stomach can cause low blood sugar, which can also cause nausea. Eat foods high in proteins and complex carbohydrates. Protein foods (e.g., eggs, cheese, and yogurt) and complex carbohydrates (e.g., whole-grain breads and cereals, dried beans and peas, and baked potatoes) discourage stomach upset and are also beneficial to both mother and baby. Avoid foods and beverages that do not sound appealing. Pregnant women usually experience at least one food aversion. The more appetizing a food appears to be, the more likely it is to stay down. Stay hydrated. Dehydration can worsen nausea, so pregnant women should drink plenty of fluids. If a woman has an aversion to fluids, she can eat foods with a high water content, such as watermelon, grapes, and other fruits. Try a vitamin B6 supplement. Vitamin B6 reduces nausea in some women, and is not harmful in recommended doses during pregnancy. Women should consult their healthcare practitioner before taking supplements. Eat or drink ginger. Ginger (Zingiber officinale) settles the stomach for some women. Ginger tea and foods made with ginger (such as ginger snaps) are usually available at grocery or health food stores. Try an herbal infusion. An infusion, or tea, of two parts black horehound (Ballota nigra), one part meadowsweet (Filipendula ulmaria), and one part chamomile (Chamaemelum nobile), taken three times a day, can soothe morning sickness for some women. Women should always consult their healthcare practitioner before taking herbal remedies during pregnancy. Wear sea bands. Sea bands are elastic bands worn around the wrists which place pressure on the inner wrist, an acupressure point for controlling nausea. They are usually used for controlling carsickness and seasickness. Keep the mouth fresh. Mints and regular tooth brushing can decrease excess saliva. Using a mouth rinse and/or brushing the teeth after vomiting is a good idea to control tooth decay and lessen stomach upset. Stay well rested. Fatigue and stress can make morning sickness worse. Some women with extreme cases of morning sickness may develop a condition known as hyperemesis gravidarium (excessive vomiting during pregnancy). These women are at risk for dehydration and insufficient weight gain, and may require bed rest and intravenous nutrition and fluids if vomiting cannot be controlled. Several antiemetic, or antivomiting, medications are available for pregnant women. Antiemetic medication should always be prescribed by a physician familiar with its use and with the patient’s medical history. Antiemetics may be contraindicated (or not recommended) for patients with certain medical conditions. They may also interact with other medications. Morning sickness treatments have varying success. Some women will find one or more remedies that can completely cure their nausea, while others may remain sick throughout their pregnancy. In addition, women expecting two or more babies usually experience heightened morning sickness due to the higher level of pregnancy hormones in their bodies, and may suffer from nausea and vomiting for a longer time than women with a single pregnancy. However, for the majority of pregnant women, nausea stops or at least diminishes by the end of the first trimester. The best cure for preventing bouts of nausea is to eat frequently. Many women find that eating six small meals or snacks a day (morning, mid-morning, noon, afternoon, evening, and bedtime) prevents stomach upset. 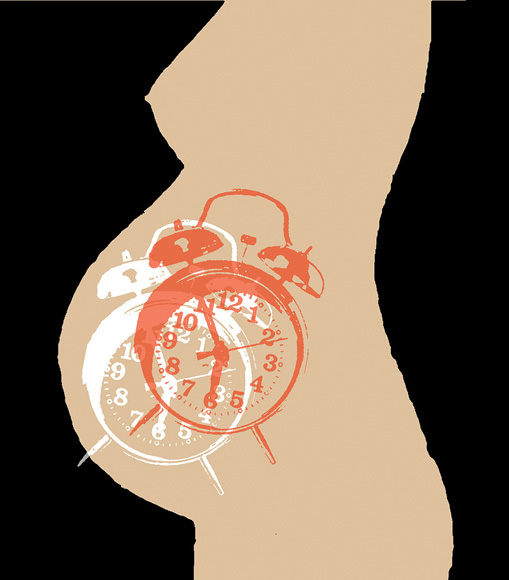 Getting adequate rest can also help to keep morning sickness at bay.